NOTE: I'm not involved with the Windows Team or the Windows Insider Program. This blog is my own and written as a user of Windows. I have no inside information. I will happily correct this blog post if it's incorrect. Remember, don't just do stuff to your computer because you read it on a random blog. Think first, backup always, then do stuff. Beta testing is always risky. The Windows Insiders Program lets you run regular early builds of Windows 10. There's multiple "rings" like Slow and Fast - depending on your risk tolerance, and bandwidth. I run Fast and maybe twice a year there's something bad-ish that happens like a bad video driver or a app that doesn't work, but it's usually fixed within a week. It's the price I pay for happily testing new stuff. There's the Slow ring which is more stable and updates like once a month vs once a week. That ring is more "baked." This last week, as I understand it, a nasty bug made it out to Fast for some number of people (not everyone but enough that it sucked) myself included. I don't reboot my Surface Book much, maybe twice a month, but I did yesterday while preparing for the DevIntersection conference and suddenly my main machine was stuck in a "Repairing Windows" reboot loop. It wouldn't start, wouldn't repair. I was FREAKING out. Other people I've seen report a Green Screen of Death (GSOD/BSOD) loop with an error in volsnap.sys. The goal is to get rid of the bad volsnap from Windows 10 Insiders build version 17017 and replace that one file with a non-broken version from a previous build. That's your goal. There's a few ways to do this, so you need to put some thought into how you want to do it. NOTE: At the time of this writing, Fast Build 17025 is rolling out and fixes this, so if you can take that build you're cool, and no worries. Do it. 1. Can you boot Windows 10 off something else? USB/DVD? Can you boot off something else like another version Windows 10 USB key or a DVD? Boot off your recovery media as if you're re-installing Windows 10 BUT DO NOT CLICK INSTALL. You may need to do special keystrokes to boot off your USB key. On Lenovo it's F2, or F10. On Surfaces it's Power+Volume Down. Go search for "boot off usb MANUFACTURER NAME" for your computer! Do you not have a copy of Windows 10 you can put on an 8 gig or larger USB? You can use this download tool on another machine to make a bootable Windows 10 USB. When you've run Windows 10 Setup, instead click Repair, then Troubleshoot, then Command Prompt. It's especially important to get to the Command Prompt this way rather than pressing Shift-10 as you enter setup, because this path will allow you to unlock your possibly BitLockered C: drive. NOTE: If your boot drive is bitlockered you'll need to go to https://onedrive.live.com/RecoveryKey on another machine or your phone and find your computer's Recovery Key. You'll enter this as you press Troubleshoot and it will allow you to access your now-unencrypted drive from the command prompt. At this point all your drive letters may be weird. Take a moment and look around. Your USB key may be X: or Z:. Your C: drive may be D: or E:. 2. Do you have an earlier version of volsnap.sys? Find it. If you've been taking Windows Insiders Builds/Flights, you may have a C:\Windows.old folder. Remembering to be conscious of your drive letters, you want to rename the bad volsnap and copy in the old one from elsewhere. In this example, I get it from C:\Windows.old. Unfortunately, *I* didn't have a C:\windows.old folder as I used Disk Cleanup to get more space. I found a good volsnap.sys from another machine in my house and copied it to the root of the USB key I booted off up. In that case my copy command was different as I copied from my USB key to c:\windows\system32\drivers, but the GOAL was the same - get a good volsnap.sys. Once I resolved my boot issue, I went to Windows Update and am now updating to 17025. PLEASE, friends - BACK UP YOUR STUFF. Remember the Backup Rule of Three. Here's the rule of three. It's a long time computer-person rule of thumb that you can apply to your life now. It's also called the Backup 3-2-1 rule. Beta testing will cost you some time, and system crashes happen. But are they a nightmare data loss scenario or are they an irritant. For me this was a scary "can't boot" scenario, but I had another machine and my stuff was backed up. Don't take beta builds of anything on your primary machine that you care about and that makes you money. DISCLAIMER: I love you but this blog post has NO warranty. I have no idea what I'm doing and if this makes your non-bootable beta software machine even worse, that's on you, Dear Reader. Omg. So sad. I had JUST joined the Insiders too. I googled valsnap and other thing. Nothing that could help. Couldn’t install over the volumes for some reason. Wish this article has been out when I searched. the trick was to force Surface Book to shutdown, holding Power button down didn't work. But holding Volume Up kicks you at BIOS and there you can finally turn it off or select USB drive to boot from. I spent a day trying to recover from this on two different systems. I even tried another copy of volsnap.sys, but I could never get a successful boot. I ended up reinstalling Windows on both systems. Unfortunately, I didn't realize this was an issue with this particular build and ran into the same problem a few hours later on one of the systems (I hadn't rejoined the Insider preview on the other). So, I ended up installing Windows (and many apps) yet again. This time I deduced it was a problem with the build and didn't enable the Insider Preview. I also had an issue that I couldn't reinstall onto the same GPT partition and was forced to completely reformat/partition my book drive. Once 17025 was available, I re-enabled the Insider Preview Fast Ring updates and have updated successfully. Fortunately, I don't keep any data files on my C: drive, so it was relatively painless once I decided to reinstall everything. I had been considering a clean install for a while anyway, just to clean up any cruft that may have accumulated with all the preview updates. Hey Scott, thanks for this. Question, in regards to your backup plan, what's your plans for the new Crashplan for Business? Are you moving to this? Also, will the new crashplan work with Synology? I've been backing up all my home computers to crashplan, but now with the new pricing, this will be way too expensive and I don't the like the Carbonite option. You saved me some hours of time troubleshooting and would have likely re-installed windows / etc. and spent a lot more time fixing the issue. Now that I have build 17025, is it fine to opt for the 'Slow' release cycle so this doesn't happen again to me? 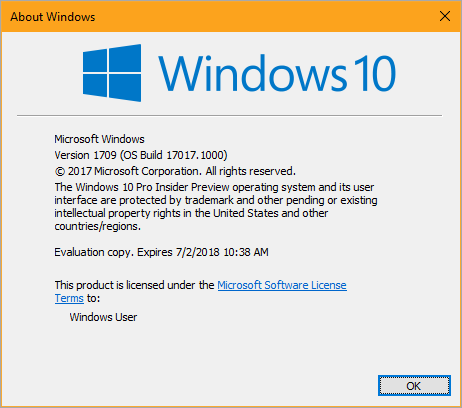 Or will that install an older build than what I currently have installed (17025)? Man, I would have given a kidney to have had this days ago. I ended up doing a full reimage. Fortunately, the ONLY thing I put on my C:\ is the OS and any application that requires it be installed on the system drive. On a positive note the event forced me to go back and validate my BIOS version and I was way behind. I am getting problem on 17025. How to recover from that? I am getting this gsod problem having tried to update from 17017 to 17025. Now what to do? Okay, so I was having the same problems as everyone else. Unfortunately, I don't have any usb drives big enough to hold windows 10. But a thought occurred to me, I did have a Windows 7 disk. Could this work? I put in the disk with fingers crossed. Went into the recovery options then to command prompt. Then I used "wmic logicaldisk get name" to list all of the drives so that I could find my usb (which I had just copied the volsnap.sys file from a working windows 10 laptop that I have). I then used the built in cmd copy command to overwrite the broken volsnap file. Restarted my computer and everything is great! Thank you so much for your help, I was worried sick! Thank you so much for this. It turns out that 17017 was the good one for me. and viola! My computer is back without having to reinstall Windows. Thanks for this hint on where to look. I've been getting GSOD for a couple of days now everytime I try to take the 17025 update or leaving the computer idle for a while. The installation failed with a GSOD after 1% every time. My God. Man, you're the best! You saved my computer. With best wishes from St. Petersburg, Russia. Well, hopefully I can find someone with a working Win 10 system I can copy the file from, since I don't have a copy anywhere. Any idea why Microsoft doesn't just make a copy of the last known-good version available for download?